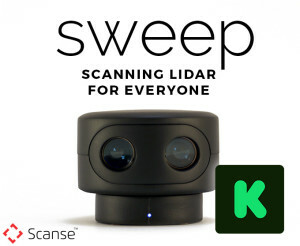 San Leandro, CA – Scanse, a young sensor development company, announced that they are running a Kickstarter campaign for their new Scanning LiDAR sensor known as Sweep. LiDAR sensors are crucial to the success of autonomous vehicles, like self driving cars and smart drones. They use laser light to detect how far away surfaces are, in order to do things like make maps and avoid obstacles. What makes Sweep different is a sensing technique which allows it to use lower power components to perform long range measurements. This lowers the cost of components, making it affordable for a larger consumer market. Sweep is the first commercial scanning LiDAR to utilize this technology, and is being sold for $249. Scanse will be providing an easy to use visualizer interface, along with many example projects to help users get started. Scanse is especially interested in the education market, and hopes Sweep will be popular among the hobby robotics and drone communities. For many, this will be the first time LiDAR is affordable enough to consider in their projects. The goal of the Sweep kickstarter is to gauge market interest in this kind of sensor. As smart drones and robots become more popular, there is a growing need for affordable sensors. Scanse thinks Sweep is the key that may unlock a world of new products. Scanse has been working on scanning LiDAR solutions for several years. They started off developing outdoor consumer robots for the home. To do any kind of mapping, scanning LiDAR or something like it is required. When they discovered that there were no affordable LiDAR sensors on the market that could work outdoors, they set out to make one themselves. Dieser Eintrag wurde veröffentlicht in Crowdfunding, English, Hardware von Sebastian Trella. Permanenter Link des Eintrags.